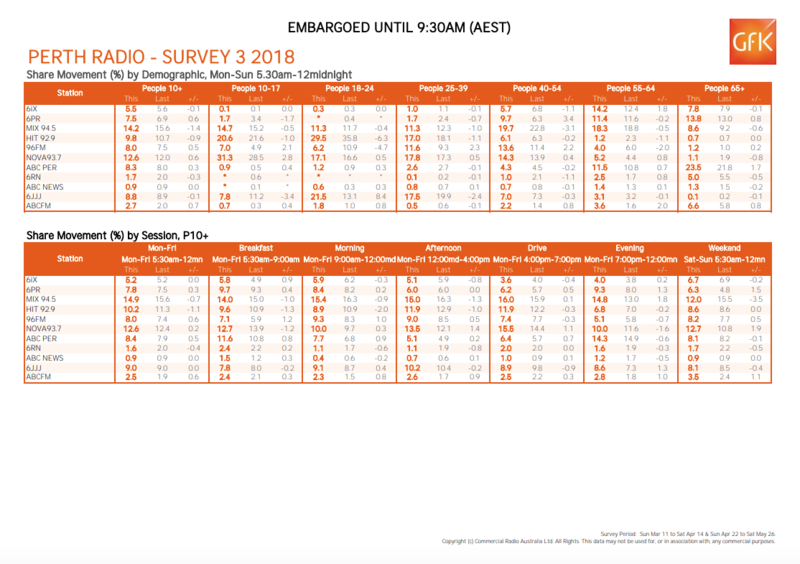 Welcome to the third GfK radio survey results of 2018. 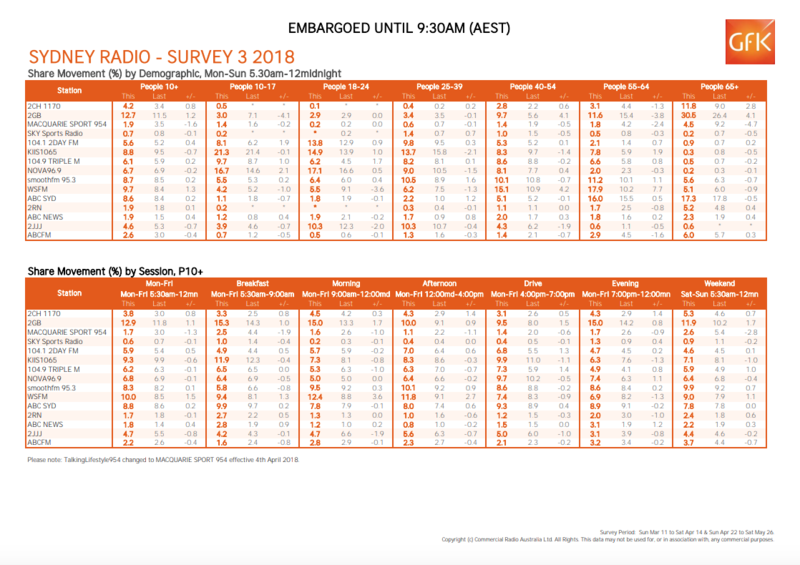 Survey 3 sees another great result for Australian Radio Network, as GOLD FM tops in Sydney and Melbourne, beating out Fox FM in the latter market by a whisker. WS is now officially having its strongest year since 1998. Nova has also had a strong book, with Kate, Tim and Marty topping two markets on Drive, while Will and Woody are down in the key markets of Sydney and Melbourne, also losing their top spot in Adelaide to Nova. Sydney’s 2DayFM Breakfast continues to make steps in a positive direction as well. Radio Today will continue its rolling ratings coverage, including The Spin. 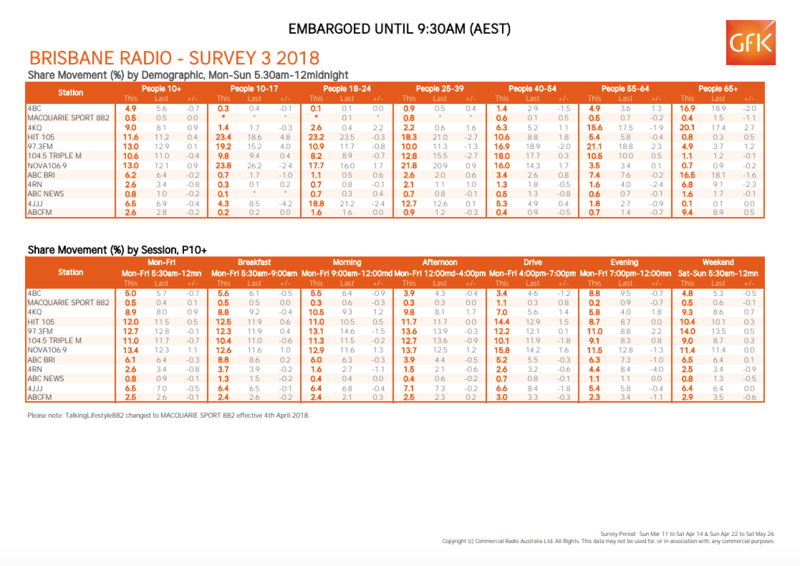 Sydney’s love of talkback continues to keep AM as relevant as ever, with 2GB now on 12.7% (+1.1) of People 10+ in the latest radio ratings – every shift showing notable growth. It’s a different story, however, for Macquarie Media’s sister station Sport 954. It’s early days for the format but the station now sits on a record low of 1.9% People 10+ (-1.6). Over on FM, and ARN have cause for a breakfast champagne. WSFM is Sydney’s most listened to on the band with 9.7% People 10+ (+1.2). On KIIS 106.5, there is absolutely no stopping Kyle & Jackie O who continue their double digit steak – 11.9% – that began in 2018’s first book. 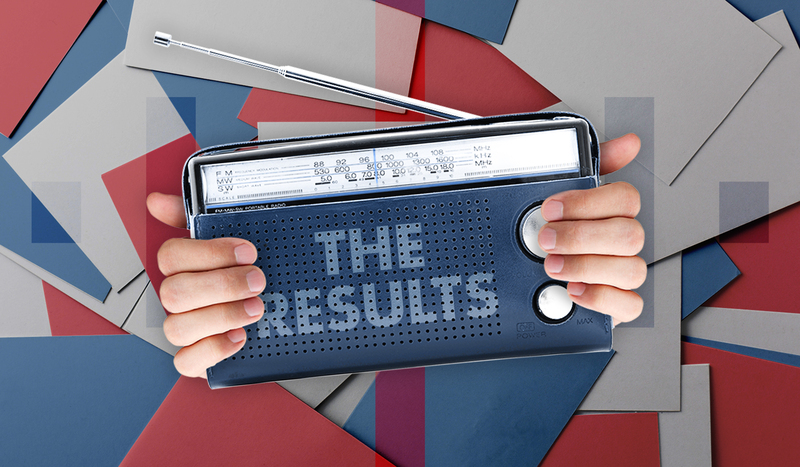 SCA’s 2Day FM’s share of People 10+ increased slightly (+0.4) to 5.6%, but the new Breakfast offering of Em, Grant & Ed is still rather steady on 4.9% (+0.5). Small gains for all three commercial AM stations in Melbourne, albeit a small one for the new Sport 1278 (+0.1). 3AW dominate, with retuning #1’s in Breakfast and Drive. Otherwise, there is little movement on AM. Christian O’Connell begins his new Breakfast show on Melbourne’s highest rating FM station. The Pure Gold format is proving a clear winner with 10.6% of People 10+ (+0.6). But when it comes to the most important shift of the day, Fox FM mainstain it’s Breakfast lead with Fifi, Fev & Byron and, on Drive, Hughesy & Kate. With Nova now Melbourne’s only true CHR format, the station has picked up a share of the 18-24 demo (+4.7). News broke this morning that Terry is leaving leaving 97.3FM Breakfast to focus on his health and his family. This news comes as the station (+0.1) secured another strong book and shared first place among People 10+ on 13% with Nova 106.9 (+0.9). Nova’s gains were reflected in Breakfast as well, with Ash, Kip and Luttsy rising to the top on 12.6% (+1.1), sitting just ahead of Survey 2 leaders Hit105 on 12.5% (+0.6) and 97.3FM with 12.3 (+0.4). Meantime Kate, Tim and Marty extended their lead in Drive, running away with 15.8% (+1.6), with strong gains also coming for Hit and 97.3FM. Triple j (-1.8) and Triple M (-1.8) were both down almost two points either overall. Mix’s dominance in Adelaide remains unbridled ahead of the rest of the competition, despite a drop to 14.8% (-0.9). The battle for Drive is still the most tightly fought in the market, and following a trend across the country on FM, Kate, Tim and Marty rose to 13.6% (+0.6), toppling Survey #2 winners Will and Woody with 13.1% (-1.0). AM Drive was also hotly contested with FIVEaa’s Rowey and Bicks on 9.6% (+1.3) clenching first place ahead of ABC’s Jules Schiller on 9.5% (-0.2) by a single percentage point. Mix remains #1 overall in Perth despite a significant downward swing to 14.2% (-1.4) in People 10+ in what was a fairly predictable book. Hit92.9 was another to fall (-0.9), with several stations including 96FM and Nova sharing the gains with AM. The biggest shifts were in Breakfast too, but nothing was enough to topple Mix. 96FM was one of the only FM stations to gain Breakfast numbers (+1.2), while Mix (-1.0), Hit (-1.3) and Nova (-1.2) all fell. Perth remains the only market that SCA’s new Drive duo Kennedy Molloy is topping, as they won out a two-horse race with a steady 16% (+0.1), despite a surge from Nova’s Kate, Tim and Marty to 15.5% (+1.1). The result is even more disastrous for Macquarie Sports Radio in Sydney when you consider that this is a rolling survey. Survey 3 covers the period from March 11th to April 14th, and April 22nd to May 26th. The new sports format launched on April 4th, so their ratings of 1.9% is inflated as it includes nearly 4 weeks of the much higher rating Talking Lifestyle format. The next survey should show MSR’s ratings drop below 1%. First survey out for Melbourne’s Macquarie Sports Radio 1278, with a boost at breakfast time for SEN and a great footy performance on the weekend by 3AW. Goes to show how difficult it is to shift listening habits, even with a bit of pay-off (still too small however) by recruiting the former SEN drive team. You only need to look at 4KQ’s latest performance to understand the potential appeal of a station that ticks the 65+ Box first and foremost yet still has an appeal extending as young as 40+ (KQ even went up in that demo). It shouldn’t be going back to Magic and its 3MP orgins. But with all FM moving on to Gen X or younger, a rebooted oldies stations and a freshly painted brand would suit 1278. Even if MSR rebounds north of the Murray (where at least it has rugby league to draw in an audience and no competition from SEN), it was reasonably arguable that MSR isn’t going to work in Melbourne from Day One. You’re quite right Joey. I’m 49 and 4KQ is the only commercial radio station I listen to, apart from the DAB offerings Triple M Greatest and Classic Rock. I wouldn’t touch the mainstream FM stations in Brisbane with a barge pole. They need to relaunch 4BH with a “Smooth FM” format ASAP. Macquarie Sports is a fail, just as Talking Infomercials was. Lowe to Sydney Hit breakfast. They have been trying for years.